Since notably cold weather struck at the end of February I’ve lost count of the number of times I’ve heard this phrase uttered by the public and some sections of the press. The ‘Beast from the East’ (versions 1.0 and 2.0) really captured the imagination in an age where everything has to have a label slapped on it; any message that these cold spells are ‘weather’ and not ‘climate’ seems to get lost. Both spells, indeed the general pattern of our late winter weather, were driven by the stratospheric sudden warming event that lead to a split polar vortex in February – leading to a very cold end to the month and a mean temperature anomaly of -2.5C, the greatest monthly anomaly since March 2013. To put it into perspective, however, it was nothing like some of the anomalies that occurred in the early 19th century: January 1814, for example, saw a monthly anomaly of -8.2C and coincided with the last occasion a frost fair was held on the Thames. Januaries back then were generally very cold, the 1801-1831 average monthly mean was -3C, that’s 8C colder than the most recent 1981-2010 average! So climate now is much warmer but that is not to say that anomalously cold months can’t happen. February 1986 saw an anomaly of -5.6C, the 13th= greatest cold anomaly in my local dataset going back to 1797. The cold December of 2010 recorded an anomaly of -4.2C, 76th= greatest cold anomaly, while anomalies of -4.1C recorded in January 1979 and March 2013 were 77th=. With the warming climate it is no surprise that most warm months happened very recently. The balmy month of December 2015 saw a positive anomaly of 5.4C. The ‘Beast from the East 2.0’ was caused by a narrow tongue of extremely cold air from Russia scoring a direct hit on the UK. The odds of this happening must have been low but it is an example of how, when the synoptics of the atmosphere line up perfectly, anything is possible. And it is an example how even in a warming climate the UK can still be subject to anomalous cold and warmth at any time of the year. The upper air anomaly of the ‘Beast from the East 2.0’. Because the above graphic is crowded I created one of anomalies since 1970. The upward trend is the same. The race to build more riverside property on London’s floodplain has received another boost after a big development on the Greenwich Peninsula was given the green light. The Financial Times reported on Friday that Boris Johnson has given final approval to an £8.4bn, 12,700-home development that would transform this area of south-east London into a “high-rise urban village complete with film studio”. Knight Dragon have already begun construction on the project, a 150-acre scheme approved 10 years ago in a more modest form but revived and expanded after the financial crisis. The report mentions that local residents are concerned the scheme will place unbearable strain on the area’s transport links and that the size and density is out of keeping with Greenwich’s World Heritage Site of 17th to 19th-century buildings close by. 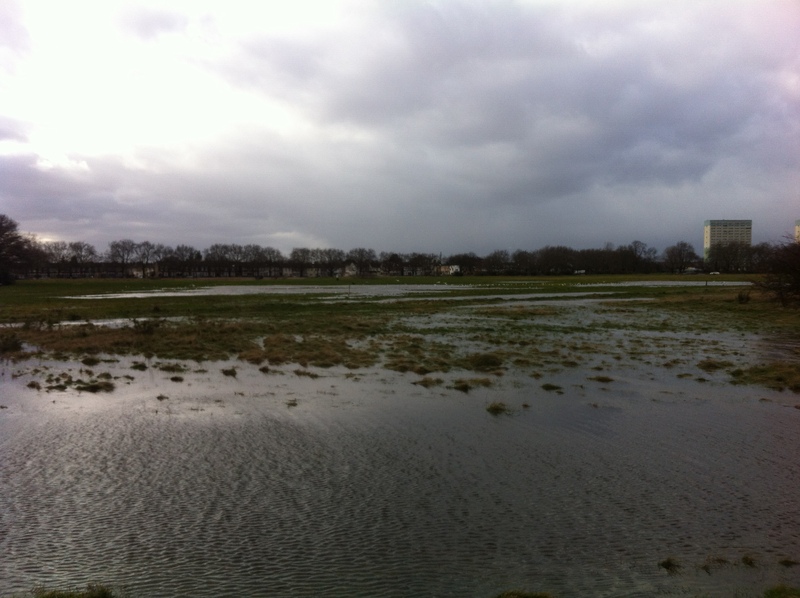 But is it wise to build on historic floodplain? Surely we should be looking elsewhere in London for safer sites for projects that will help ease the housing crisis. The website floodlondon.com shares concern that developments such as these are at severe risk from a tidal surge when the Thames Flood Barrier nears the end of its working life in the middle of this century. Before the Thames Barrier was built this part of the river has seen some catastrophic flooding. In November 1875, a year that was only slightly wetter than normal, a record high tide of 8.9m was recorded at Blackwall. The figure is 1.36m (4ft 6in) higher than the greatest high tide at North Woolwich (Silvertown) this year, according to tide tables drawn up by the Port of London Authority (7.54m on March 20th). The flood brought chaos throughout London – with this part of the river particularly badly hit. Much of the Isle of Dogs was inundated, North Woolwich Gardens were under 3ft (1m) of water while the water caused explosions at the Royal Arsenal. Elsewhere in the capital Eton College was ‘completely surrounded by water’. A correspondent for the Press Association said the damage caused on the banks of the Thames was estimated to cost £1m sterling – just over £103m at today’s prices. The Sunderland Daily Echo & Shipping Gazette on Tuesday, November 16, 1875 reported a depth of water at East India Docks of 29ft 2in. Damage was estimated to be £1m sterling – just over £103m at today’s prices. Since the flood of 1953 measures, including the Thames Barrier, were put in place to stop this flooding. 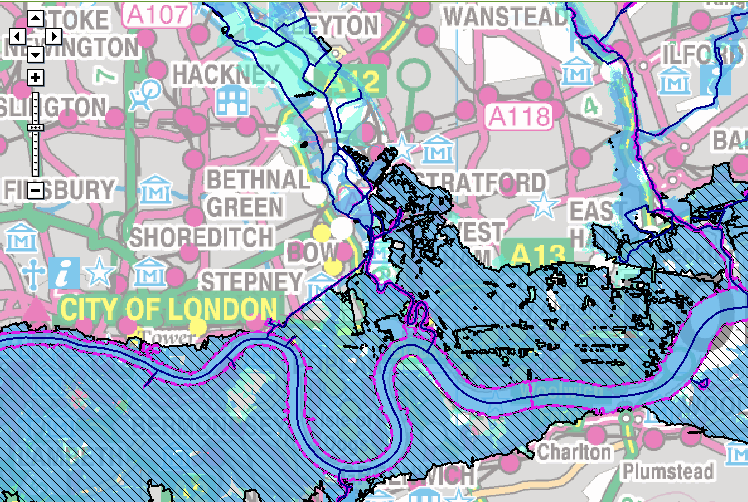 The Environment Agency has outlined a range of options for the future of the Thames Estuary flood defences. None are particularly cheap. As a minimum, the EA estimates that the cost of maintaining the defences until 2035 will be around £1.5 billion, with an additional £1.8 billion needed to repair and upgrade the defences until 2050. Particular bits of marshland could also be set aside to store tide waters. The EA estimates a new barrier could cost as much as £7 billion, though that figure could go up if conditions change significantly as the climate changes. Greenwich Peninsula and another project, City in the East, which was announced last month will need proper flood protection and planning. I wonder if planners are as willing to invest in these defences as they are at making a tidy buck developing these riverside schemes. And do our politicians have the appetite to drive the legislation through? The problem is that if the climate change does bring greater rainfall and an unprecedented sea-level rise it is the people living in these properties that will be faced with the problem of ever-increasing costs to fight off the risk of inundation. Will potent El Niño bring cold winter? Much of the UK media has been very persistent in the past few months in saying that large positive anomaly El Niño years herald cold winters – basing their assumption on one year: 2009/10. Whilst that winter was very cold, among the top 10 coldest of the last 70 years in this area, another El Niño year, 1997/98 – the strongest in recent history – brought London its third-warmest winter in a record going back to 1797. When I had a look at ENSO data going back to 1950 a few months ago I found it impossible to find a definitive teleconnection between El Niño and winters in north-west Europe. However, now that we are midway through November, and with a fair impression of how the monthly mean will finish, I had another look. NOAA data shows that the most similar El Niño years to this are: 1957, 1965, 1972, 1982, 1997, 2002. Taking in to account only mean temperature shows that November values have increased. What does this mean for this winter? It is still impossible to tell and is just another variable to consider when the time comes to predict winter. The climate of London can vary greatly to figures revealed in the Central England Temperature series. Because this dataset covers an area of the UK enclosed by Lancashire, London and Bristol the resulting monthly mean temperature can often be quite a bit lower than what is experienced in the capital. Though these anomalies are smoothed in the monthly series that stretches back to 1659 notable daily extremes that happen nationwide tend to get lost. One example was earlier this month when the UK’s November maximum temperature record was broken. Trawsgoed in Wales reached 22.4C on the afternoon of the 1st whereas a largely foggy east London recorded just 11.5C. Comparing CET with data from Greenwich back to 1850 reveals a gradual decoupling between the two series, the warmth of London’s urban heat island effect an ever-growing influence. 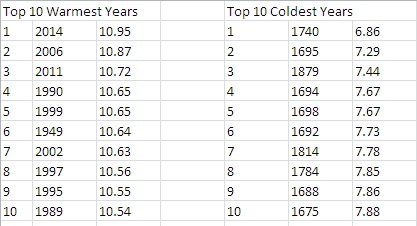 The 1851-1880 30-year average means show that Greenwich was 0.6C warmer than the CET series. By 1981-2010 this gap had widened to 1.2C – indeed the London series is today 1.4C warmer than it was in 1851-80 whereas CET has warmed by only 0.6C. Delving further into the data reveals an increase in the number of times that the 30-year average mean is being breached by at least 1.1C. The period 1961-90 was the warmest in both cases with the mean being breached by 1.1C or more on four occasions in the case of CET and five in London. It is interesting to note, however, that the largest anomaly in the CET series is 1.3C in 1921, greater, albeit by only 0.1C, than the warm years of 1990 and 1999. 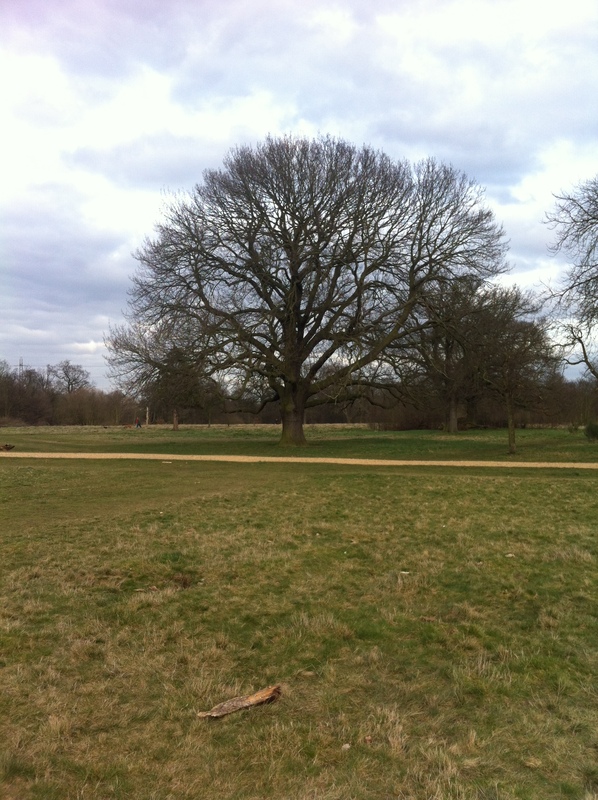 The largest anomaly in London, 1.6C, was set in 2011, 0.1C higher than 1999, 1997 and 1989. The graph below shows the number of occasions that the 30-year average has been exceeded in each period by 1.1C or more. With 1961-90 being so warm it appears that CET warming has slowed though it should be borne in mind that we have another five years before the 1991-20 series can be released. With reference to the London graph below showing the number of occasions that the 30-year average has been exceeded in each period by 1.1C or more merely confirms that the level of the anomalies have increased but, as already mentioned, there are probably far more outside influences affecting the outcome such as UHI, population growth, further industrialisation etc. The accelerated warming is a worry in terms of how London would adapt should summer temperatures greatly increase, though, of course, it remains to be seen if the anomalies will advance even further from current levels. Global temperatures are on the rise though our part of the globe may not be as adversely affected as elsewhere. * The CET dataset is the longest instrumental record of temperature in the world. The mean, minimum and maximum datasets are updated monthly, with data for a month usually available by the 3rd of the next month. A provisional CET value for the current month is calculated on a daily basis. The mean daily data series begins in 1772 and the mean monthly data in 1659. Mean maximum and minimum daily and monthly data are also available, beginning in 1878. For more information on CET follow this link. Plans to build 200,000 homes in East London over the next 20 years should be music to the ears of anyone struggling to find a place to live in our overcrowded capital. A report in the Financial Times, citing the new plan, says there is much more potential than previously thought to increase housebuilding in east London, the capital’s planning chief estimates. 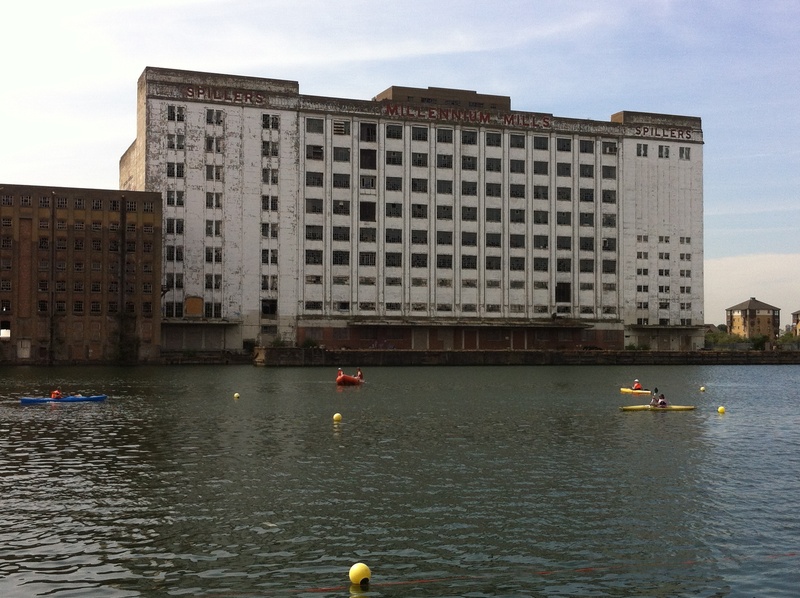 Sites earmarked include the Lea Valley and areas along the Thames beyond Canary Wharf. 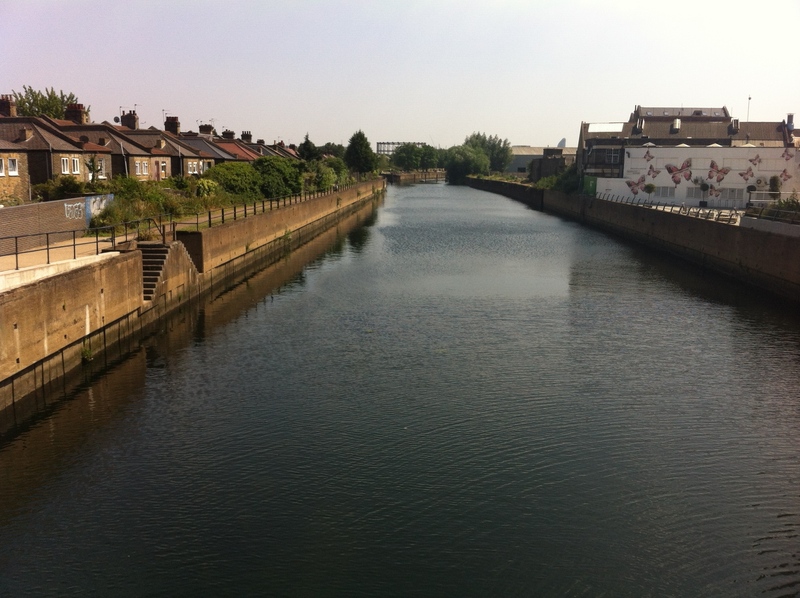 The River Lea close to where Luke Howard’s laboratory stood. 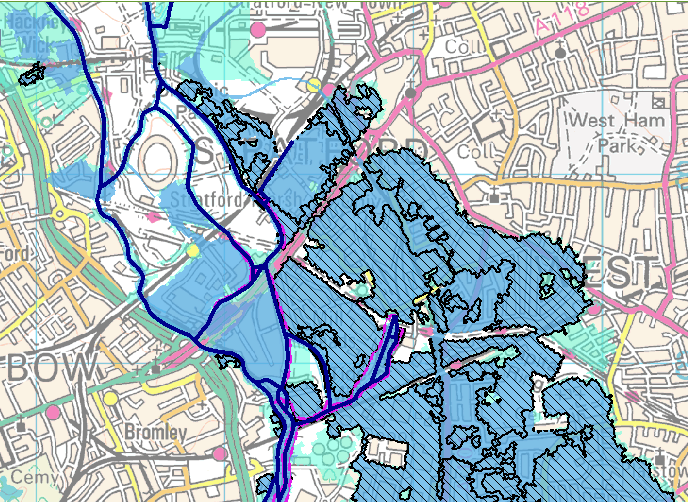 Since it was completed in 1976, there have been no major flood events in the Lea Valley, although there have been three occasions when the river system was full virtually to its capacity: in 1987, 1993 and 2000. Every so often the UK experiences severe weather which shocks a population that is very used to our mostly benign climate. Newspapers and media agencies, in an age where a culprit must be found to blame, are quick to connect every gale, flood and snowstorm with climate change. To say it is just ‘weather’ doesn’t compute with the average news editor. A look back through archives from the 19th century reveal that this is not a new phenomenon. Though extreme weather events, including the heatwave of 1808 and widespread floods of 1811 and 1828, were always well documented, it wasn’t until the advent of reliable meteorological readings in the mid 1800s that scientists could analyse what was happening to the atmosphere with any authority. This, coupled with an explosion in literacy rates and the British fascination with the weather, helped build an appetite for news stories that went beyond covering each gale, flood and blizzard. The year 1868 saw months of extreme weather that led newspapers on a mild and rain-sodden Christmas Eve to first ask the question: ‘Is our climate changing?’ The year had been the warmest for 34 years. The CET mean for 1868 was 10.4C, a figure nearly 1.3C above the 1831-1860 average. To put that into perspective 2014 was only 1C above the 1981-2010 average. A review of weather in 1868 in the Falkirk Herald said the year had started very wet – a farming diary kept in Connaught, Co Mayo, said that January was so wet it was impossible to plough the land. The very wet weather lasted until the last week of March. In the Armagh record, all three months had well-above average rainfall, with the three-month total of 363 mm representing around 180 per cent of the long-term average. By contrast the summer of 1868 was very hot and dry, with some of the highest temperatures ever recorded for the second half of July occurring in this year. There was a remarkable spell of hot days, with temperatures over 30C in England. For the south-east specifically, a maximum temperature above 32C was recorded in each of the months from May to September, and in July, the temperature exceeded 32C on 9 days. It was regarded for many years, until 1976 at least, as the longest (because of a lack of rainfall) and hottest in the instrumental record for England. Although not accepted under modern methods, because of problems of comparison between Glaisher stands and Stevenson screens, the maximum temperature recorded on July 22nd, 1868 at Tonbridge, Kent, is still remarkable: 100.6F (38.1C). It is thought that this value, when compared with a standard Stevenson screen, is about 1.5C or 2C too high. The subsequent ‘standard’ winter (December, January and February) became the warmest winter in the CET series which began in 1659, a record that still stands today. The mild temperatures suggest a highly zonal, westerly pattern held sway from late November 1868 until at least February 1869. Snow was scarce in 1868 – with the only heavy falls on March 3rd and 8th and November restricted to northern England and Scotland. The Falkirk Herald goes on to point out that winters, for the past 25 years, were mostly mild and wet – any bitter spells were short-lived. The piece cites Gilbert White’s Natural History of Selbourne which tells of a scene in January 1776 when “narrow roads were filled with snow to the tops of the hedges”, stopping road wagons and coaches in their tracks. White, regarded as England’s first ecologist, remarks that on a visit to London on the 22nd the metropolis was completely embedded in snow. A frost on the 27th lasted four days and was so intense that the Thames froze sufficiently enough for crowds to run about on the ice. More tellingly the snow remained on houses in the City for 26 days – these days we’re lucky if we see snow fall at all in the centre. To the strong and hearty the frosts and snows of a bitter winter may seem genial and invigorating ; but they bring death with them to the weak, the ailing, and the aged. It had been nine years since Charles Darwin published On the Origin of Species and many people were starting to turn away from the popular theory that many weather disasters were the work of God. Less than 5 years later the question ‘Has our Climate Changed?’ was being asked again. 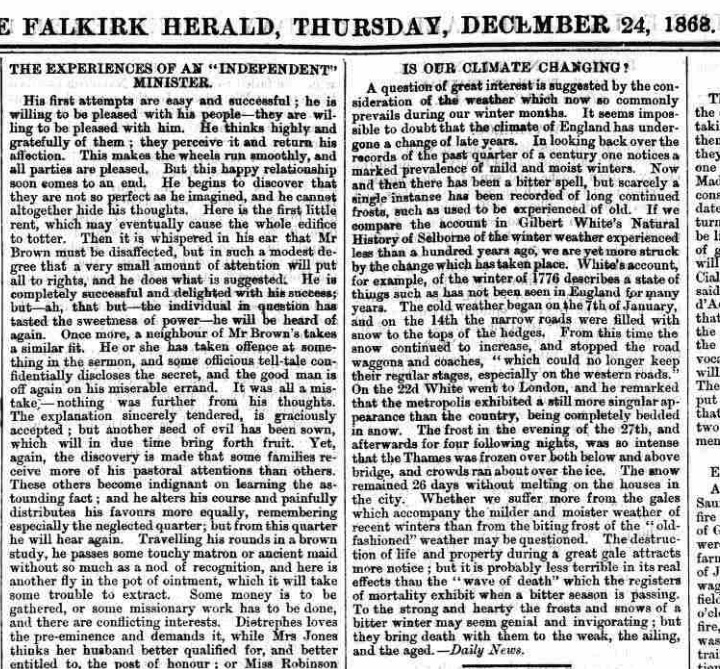 An article in the Fife Herald on January 30th, 1873, reported that winters were milder and that summers were colder – less frost and snow and much more rain. The month had been mild, nearly 2C above the 1841-70 mean, but the rain was more notable: 80mm, 136% of the EWP average. The wet January was a continuation of the previous 12 months which had been the wettest on record: 1284.9mm, a record in the EWP series that remains to this day. There has been a wetter 12 month period just once – April 2000 to March 2001. The wet conditions extended across Ireland too; in the Armagh record, the 12 months from February 1872 to January 1873 saw 1251 mm of rain fall, which represents about 150 per cent of the long term average for this station. A farming diary in Connaught, Co Mayo, stated that the persistent wet weather caused considerable distress through loss of harvests and difficulty of working the land. By the time the question: “Is our climate changing?” was asked again, 16 years later, the climate had turned much colder with the return of snowy winters. 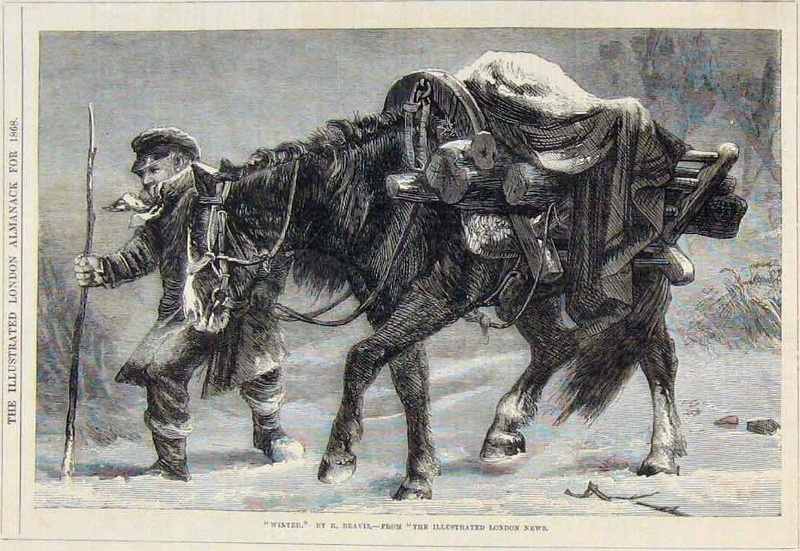 Snow fell on 16 days in February 1889 – a storm on the 10th and 11th dumped 20-30cm of snow widely across England. Days later the Hull Daily Mail reported a statement by Professor Cleveland Abbe which said that the climate of the earth had not changed in 2,000 years. The study of each and all of these phenomena has failed to establish that there has been any sensible change in the climate at any point of the earth’s surface during the past 2,000 years. It is not clear if Professor Abbe’s words were taken out of context but it is interesting that such a well-respected scientist had the confidence to make such a statement. The year 1888, part of a string of colder than average years that followed the huge Krakatoa volcanic eruption in Indonesia in 1883, had seen other extreme events. In July ice is reported to have disrupted the fishing fleets around the Faroe Islands, implying cold conditions at these latitudes, probably extending to at least the Shetland Isles. 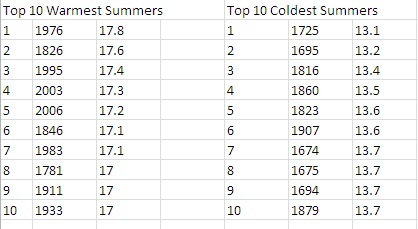 It was a notably cold summer; a mean of 13.7C puts it just outside the ‘Top 10’ of coldest summers in the CET series. In London the summer was 1.8C cooler than average and rainfall was 139 per cent of normal for that period. It was also the dullest on record. Two decades were to pass before the question: ‘Has our climate changed?’ appeared again following a fairly mild and wet winter. The Dundee Courier, on April 9th 1908, suggested that winters had grown milder but admitted there was no known cause. It said that the Thames had not frozen over for nearly 100 years but that this was partly caused by the fact that London Bridge was replaced 80 years previously, totally changing the tidal flow of the Thames. Five months later a soggy Dublin Horse Show prompted the Wells Journal on September 10th to report on findings by the meteorologist Sir John Moore featured in the Geographic Section. He looked at Rev William Merle’s writings from the 14th century and observations made in Greenwich from 1774. The facts prove that within the last six centuries at all events appreciable change has taken place in the climate of the British Isles. There is no scintilla of evidence to show that such change has taken place in the past or is likely to take place in the future. On Boxing Day 1908 the Gloucestershire Echo cited an ancient weather report featured by Sir John Moore. In 1341 the month of April saw continuous frost from 6th to the 13th while the following autumn saw spring-like weather persist from September to December: “Our climate hasn’t changed in 600 years.” was the claim. 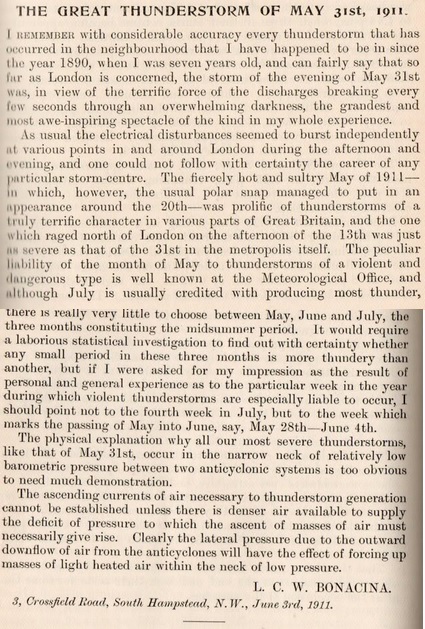 A poor summer in 1909 that began with the coldest June for over 230 years once again prompted the question ‘Is our climate changing?’ to be asked again by the Wells Journal on August 5th, 1909. The report says that the climate of Europe is growing colder – with periodic cold summers. It goes on to say that cold summers have happened in the past, mentioning the following years: 820 (cold and wet – most crops perish), 1033 and 1044 (cold and wet, caused famine), 1151 (rain falls in France continuously from end of June to middle of August), 1219, 1315, 1423 and 1512 (cold and wet summers) – in 1512 several people, accused of causing bad weather, were burned at the stake. 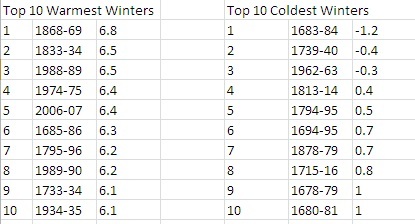 Other years: 1596, 1639, 1641, 1667 – all had very cold Junes. The years 1809, 1812, 1813, 1816 all had cold summers. Around the country there were some notable readings. On June 6th a high of just 10C was reached in Oxford and Bath. It was notably cold and wet with significant thunderstorms from 10th to the 12th and 20th to 28th. In London the Trooping the Colour ceremony on 24th was cancelled because of poor weather – one of only four occasions it has been cancelled due to weather since its inception in 1895. It was also a very dull month with no sunshine at all in London from June 2nd to 6th. The year 1911 produced more remarkable weather and some violent thunderstorms. On May 31st, as the Titanic was being launched in an overcast Belfast, some 17 people were killed by lightning strikes across London and four horses died on Epsom downs on what was the day of the Derby. 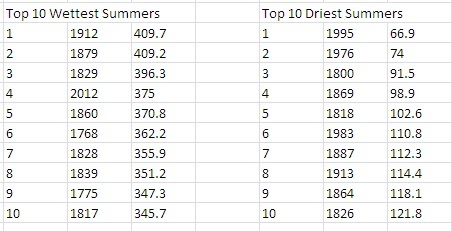 About 62mm of rain fell in 50 minutes on the Downs and there were 159 lightning strikes in 15 minutes around 5.30pm. The summer season that year was the warmest for 65 years with many areas having less than half their normal rainfall. July was spectacularly sunny with an average of over 10 hours of bright sunshine over much of southern England: 384 hours of sunshine were recorded at Eastbourne and Hastings, East Sussex, during this month, and these are thought to be the highest sunshine totals recorded anywhere for July in the UK. For the SE of England, with something like 300-350 hours of bright sunshine, this month (with July 2006) is regarded as the sunniest month on record. The month was also exceptionally dry and is still among the ‘Top 5’ dry Julys in the EWP series. 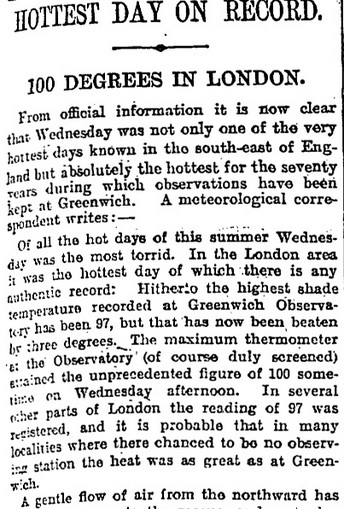 August was also warm: the 9th produced the first occasion when 100°F was recorded in London. During the autumn of 1911, the Shields Daily Gazette on Wednesday, October 25th, was reporting that ‘weather prophets’ were predicting that the UK was in for an exceptionally cold winter. The predictions were based purely on the fact that the country had not had a bad winter in more than 15 years, the last occasion on which the Thames was partly frozen over in the early part of 1895. “If very cold winters come on an average once every twelve years, an old-fashioned winter is certainly overdue, for there is no ground for supposing that our climate is changing. But it is not the case that cold winters follow hot summers as an invariable rule. They sometimes do so, but the contrary would seem to be as often the case, for the hot summers of 1868 and 1887, to quote two examples, were followed by comparatively mild winters. The law of averages is certainly on the side of a severe winter this year, but in the case of the weather it is never safe to argue from any law, and as the price of coal is going up, everyone must hope that this time, at all events, the Clerk of the Weather will be merciful. In the event the Clerk was merciful and winter was mild. This mild theme continued for a period prompting the Dundee Courier on Monday, January 2nd 1922 to ask: “Where are our winters? Is our climate changing?” The leading article goes on: “Here we are in January, and so far we have had no snow to speak of. Yes, our climate is changing, and has been for many years. We do not need weather records to tell us that. Our memories provide striking comparisons. In our boyhood days we greased our boots, tucked our trousers in, pulled the ear-flaps of our caps (you remember the style) down tight, wrapped mufflers around our necks (but not for fashion sake), then stood by the big fire to warm up before starting to plod our way through deep snow school. “Who can forget the snowball battles after school; the hustle home for skates and to the ponds until nightfall; and then some? In those times we planned skating parties, and we were not disappointed. Do we need the records of thermometers and snow gauges to remind of the days of stinging cold and streets “piled high with snow ? Anyone who says our climate is not changing has not been on this earth long enough to know. The severe winters left indelible marks upon our grandparents and great-grandparents, and the weather developed strong constitutions. They tell of successive winters of heavy snow and intense cold, beginning early in November and lasting until late in March. The snow often was piled up from four to six feet deep on the level. “The seasons in those times were evidently well marked, for frequently made of their definite beginning and ending. Winter evidently was the season that concerned our ancestors most, for only slight mention made of any unusual summer. In Britain the last few years winter temperatures have been higher than the average. The cold period has several times occurred in the autumn and May is showing a tendency to become the most pleasant month of the year, and so we are again reminded that the climate is changing; while statisticians say that average temperatures have remained practically the same for the last 600 years. Six years later a very poor summer prompted the Dundee Evening Telegraph on Tuesday, July 3rd 1928 to again ask the “eternal question”: Is Our Climate Changing? “With days of wind and rain that have made June and July days seem more like March and at times, even November, we are still awaiting our real summer. It is not uncommon to hear people speculating as to whether, after all, our seasons are not in process of changing. “In a climate like ours,” says the writer of that interesting little book, the weather is a never-ending topic. Warmer and Colder. I have often heard old people speak of the weather changes that had taken place since their young days, as they expressed it. The summers, they said, were then much warmer, and, as an instance, they said that barley would be above the ground in forty-eight hours after sowing. It was then, they admitted, the last grain that was sown. The summers then were so hot that the cows could only be put out to pasture in the early morning and evening, as they were driven mad by the ‘glegs’ or horse flies biting them. Then the winters were almost arctic in their severity and length. The seasons were also more sharply divided, approaching those of Russia and North America in their rapid seasonal transitions. “I know that many about my own age have the same ideas of what has taken place in their time. A very hot or a very cold season or two may, as we get older, come to assume the general character of that far-off time, still I cannot but think that for a good many years past there has been more of a mixing of summer and winter than was the case fifty years ago, winter now being often found in the lap of spring, and summer-like weather about the new year. On February 5th 1929 the newspapers were promoting a “new series of talks entitled ‘Is Our Climate Changing'”. The first speaker was a Mr Gordon Manley of the University of Durham. The paper said that the talks, in view of the widespread interest in weather conditions and forecasts, should prove of rather more than usual interest. Manley later became probably the best known, most prolific and most expert on the climate of Britain of his generation. It took him 30 years to assemble the Central England Temperature (CET) series of monthly mean temperatures stretching back to 1659 – the longest standardised instrumental record available for anywhere in the world. In the Dundee Courier on Wednesday, July 29, 1931, a report on a recent article “Has our climate changed?” had aroused considerable interest. David Grewar, the well known Glenisla authority, who has a long experience of the glens, gives his views below. “Such variety of opinion exists as to whether or not our weather has changed. Some say that it has, others that it has not, and that any supposed change is due to the exaggerative effects of memory. These differences of opinion do not only exist among laymen, but among scientists as well. Making all due allowance for changed habits and the tricks of memory, the older among us are undoubtedly correct when we say that the seasons now are different from our younger days. Then our winters were more severe, our summers better; now there’s more of a levelling up between the two. Eighteen months later and the Gloucester Citizen, on Friday, January 6th 1933, asked: “Is our climate changing?” The sub heading “January mends its manners” again enquired about whether the persistent succession of mild Januaries in the present century suggested something in the nature of a change in climate? In the French Revolutionary calendar the division of the year from the middle of December to the middle of January was the month “Nivose” or “snowy”. The Anglo-Saxons called January “Wulfrnonath” because the weather was so intense that wolves, emboldened by hunger, left the forest and invaded the villages. The Dutch used to call January “Lauw-maand” or “frosty month”. Today, in many parts of the country, particularly in the south and west, amateur gardeners have the delightful rare experience of seeing standard and rambler roses in full bloom, primroses blooming in rich clumps, stocks, polyanthus, indeed, show off flowers usually retarded by frost until the spring. “January, the coldest month of the year in England, is proverbially associated with snow and ice. During the twentieth century, however, January has not lived up to its name but has been much more open, mild and stormy. with few prolonged frosts. Within five years, in 1938, Guy Callender produced a paper that developed a theory that Earth temperatures had been rising in line with increasing concentrations of atmospheric carbon dioxide. It was the first time that somebody had made this connection: the birth of the science of man-made climate change. In 1942, the Buckingham Advertiser and Free Press, on Saturday, February 21, was discussing old weather rhymes. “There was a flicker of reason, he said, in the rhyme “rain before seven, fine before eleven”. “Is our climate changing? Dealing with the question of our climate changing Mr Pettipher observed that people’s idea that the old-fashioned type of weather had gone forever, and that some such solution as the diversion of the Gulf Stream was the cause of the winter warmth, received a rude shock in the early months of 1939 and 1940, which, with the exception of 1929 were probably more severe than anything since 1895. “In terms of Buckingham rainfall the speaker emphasized the necessary practical value, especially to sailors, fishermen, agriculturists and sportsmen, and now to our airmen, of weather study and manv observations with regard to rainfall described the Air Ministry’s organisation of 6,000 observers in the different parts of the country, of whom he was one, pointing out that the work had been described as of “national importance” because of its practical value. Much has been written about climate change in newspapers and scientific papers since the war. For a long period during the 1960s and 1970s the concern was about global cooling. But this changed in the 1990s when it became scientists identified that the Earth was beginning to warm. 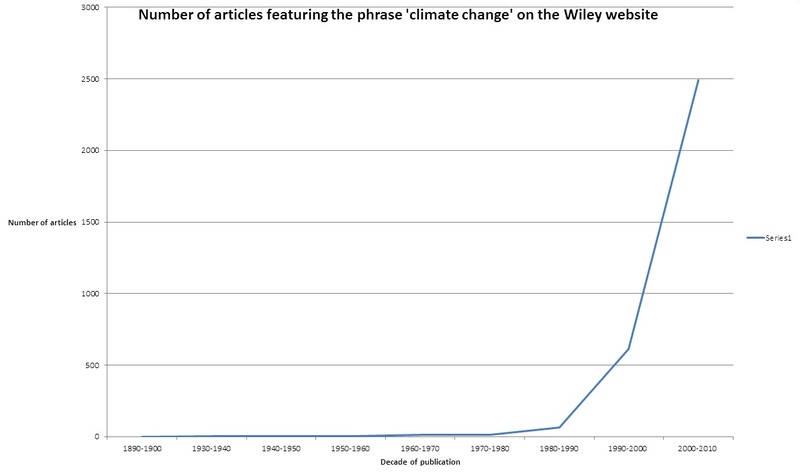 A search of Wiley, the publisher shows a sharp increase in incidences of articles and papers that feature climate change. It is surprisingly just how big the increase has been since the beginning of the 1990s. Looking at the last 10 years the Financial Times mention of the phrase ‘climate change’ is much more variable, perhaps reflecting the world financial crash of 2008 when concern was deflected away from the environment and on to the economy. Concerns over climate change today have moved on immeasurably since those first lines of concern were vented in newspapers in 1868. But the socio-economic and geo-political arguments that are associated with the science deserve a blog all on their own. The long-range models that are still being developed, together with further study of ocean sediment, ice cores, tree rings etc illustrate that there is so much more we need to learn about this fascinating subject. News editors would do well to take a moment the next time they report a hurricane, tornado, flood or snowstorm and realise that ‘freak’ events do happen and that it is not necessarily climate change that is the cause of that particular event in time.